Was a ruler of Lower Egypt during the fifteenth dynasty and the end of the Second Intermediate Period that was dominated by this foreign dynasty of rulers called the Hyksos. According to the Turin Canon of Kings, he ruled over the northern portion of Egypt for forty years, if he outlived his southern rival, Kamose, but not Ahmose I. Although his reign only entailed northern Egypt, Apepi was dominant over most of Egypt during the early portion of his reign, and traded peacefully with the native, Theban Seventeenth dynasty to the south. In Greek mythology, Epaphus (/ˈɛpəfəs/; Ancient Greek: Ἔπᾰφος), also called Apis, was the son of Zeus and Io. His stepfather was Telegonus, king of Egypt. He was also a king of Egypt. The name/word Epaphus means "Touch". This refers to the manner in which he was conceived, by the touch of Zeus' hand. He was born in Euboea, is the cave Boösaule (Herodotus, Strabo), or, according to others, in Egypt, on the river Nile, after the long wanderings of his mother. He was then concealed by the Curetes, by the request of Hera, but Io sought and afterward found him in Syria. Epaphus is regarded in the myths as the founder of Memphis, Egypt. With his wife, Memphis (or according to others, Cassiopeia); he had one daughter, Libya. Another of his daughters bore the name of Lysianassa. Epaphus also criticized Phaëton's heraldry, which prompted him to undertake his fateful journey in his father Phoebus' chariot of the sun. Belus, another mythological king of Egypt, is a grandson of Epaphus. David Rohl identifies Epaphus with the Hyksos pharaoh Apophis. May he never let me look upon him again, And may this be the last light that reaches my eyes! It would not take long for you to find your father's house. The country he rises from borders our own. If you have a mind to do so, go ask the Sun himself!" Phaëthon beamed happily at his mother's words And, imagining the heavens in his mind, He left Ethiopia in a flash, crossed India Beneath its stars, and reached his father's Orient. Ovid; Lombardo, Stanley; Johnson, W. R. (2011-02-28). Metamorphoses (Translated & Annotated) (pp. 28-32). Hackett Publishing. Kindle Edition. According to corrected chronology, the Expulsion of the Hyksos from Egypt falls into the window of time, when Deborah was a Judge over Egypt, and as the song states, the stars fought from their courses, which is also the exact same terminology used in the discourse to Solon, as he was being told by the Egyptian priest that these cycles of destruction have occurred many times, in which the Greeks who are young of age, still retain in their story of Phaethon. The cycle between these great catastrophes, can be locked into a roughly a 130 year time span. Backdating from the Mahabharata War, when a twofold omen was observed, where two separate comets, dark in color with copper contained within, burned red. One Hundred and Thirty years, previous to this, also coinciding with eighty years prior to the birth of Moses, a Chinese record speaks of seeing Ten Suns in the Sky at once, and was considered a great omen. The Xian Dynasty came to a halt, as great famine, plagues and destruction occurred. This can be accurately dated through the corrected chronology of the Xian and Shang Dynasties, to have occurred somewhere around 1607 BC. The tree ring records of this same time frame also confirm that a major catastrophe occurred somewhere around 1607 BC. The same description of this object that broke apart into ten pieces is also described in the Ramayana, the great Hindu epic. It has been verified that this epic is a historical record of events during the time, in which they were recorded. The ten headed Ravana appears as if this could be a record from another part of the world, depicting what transpired around 1607 BC in the Chinese records. Ravana is the primary antagonist in the Hindu epic Ramayana, where he is depicted as the Rakshasa king of Sri Lanka. Ravana is depicted and described as having ten heads. He is described as a believer of the god Shiva the Destroyer, a great scholar, a capable ruler and a maestro of the Veena, but someone who wished to overpower the gods. In the great epic Ramayana, he is the antagonist. Being a polygamist, kidnapping Rama's wife Sita, to exact vengeance on Rama and his brother Lakshmana for having cut off the nose of his sister Surpanakha. In other contemporary smaller texts (Meghnad Bodh Kavya) from later periods, his qualities as a responsible king full of all royal qualities are explained. In the book of Judges, as the stars fought from their course, fell in an eight year window, after the approximate calculation of one hundred and thirty years, between events, to around one hundred and thirty eight years. When backdating, looking for an approximate span very similar to this timeframe, The Great Comet of 1882 is exactly one hundred and forty years, with a margin of two years, this is a fairly reasonable estimation, when dealing with the complexities of calculating the orbital mechanics of a comets return. Being that this is part of a comet family, which scientists believe is the fragments of a much larger comet that broke apart. It would be safe to conclude, that this is one and the same, as the "Large Comet" that has continued to cause these cyclical cosmic catastrophes, as the evidence quite clearly shows. Marking off the fall Feast Dates of 1965: Comet Ikeya–Seki appeared, throughout the fall feasts and from November through January, when in January astronomers observed the comet break up into three pieces. This all happened one year before Rosh Hashanah of 1966, when the first of the four Blood Moons in the Blood Moon Jubilee which comes to an end on Rosh Hashanah of 2015, completing a cycle of forty nine years, one Jubilee. Heinrich Kreutz, who first demonstrated that they were related. Several members of the Kreutz family have become Great Comets, occasionally visible near the Sun in the daytime sky. The most recent of these was Comet Ikeya–Seki in 1965, which may have been one of the brightest comets in the last millennium. It has been suggested that another cluster of bright Kreutz system comets may begin to arrive in the inner Solar System in the next few years to decades. Many hundreds of smaller members of the family, some only a few meters across, have been discovered since the launch of the SOHO satellite in 1995. None of these smaller comets has survived its perihelion passage. 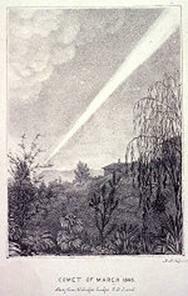 Larger sungrazers such as the Great Comet of 1843 and C/2011 W3 (Lovejoy) have survived their perihelion passage. Amateur astronomers have been successful at discovering Kreutz comets in the data available in real time via the Internet. Comet Ikeya–Seki is the most recent very bright Kreutz sungrazer. It was discovered independently by two Japanese amateur astronomers on September 18, 1965, within 15 minutes of each other, and quickly recognised as a Kreutz Sungrazer. It brightened rapidly over the following four weeks as it approached the sun, and reached apparent magnitude 2 by October 15. Its perihelion passage occurred on October 21, and observers across the world easily saw it in the daytime sky. A few hours before perihelion passage on October 21 it had a visible magnitude from −10 to −11, comparable to the first quarter of the Moon and brighter than any other comet seen since 1106. A day after perihelion its magnitude decreased to just −4. Japanese astronomers using a coronagraph saw the comet break into three pieces 30 minutes before perihelion. When the comet reappeared in the morning sky in early November, two of these nuclei were definitely detected with the third suspected. The comet developed a very prominent tail, about 25° in length, before fading throughout November. It was last detected in January 1966. It was discovered independently by two Japanese amateur astronomers on September 18, 1965, within 15 minutes of each other, and quickly recognised as a Kreutz Sungrazer. Result: 18 days, 8 + 10, this is a TEN DAY INTERVAL. It brightened rapidly over the following four weeks as it approached the sun, and reached apparent magnitude 2 by October 15. A few hours before perihelion passage on October 21 it had a visible magnitude from −10 to −11, comparable to the first quarter of the Moon and brighter than any other comet seen since 1106. A day after perihelion its magnitude decreased to just −4. The first comet whose orbit had been found to take it extremely close to the Sun was the Great Comet of 1680. This comet was found to have passed just 200,000 km (0.0013 AU) above the sun's surface, equivalent to about half the distance between the Earth and the Moon. It thus became the first known sungrazing comet. Its perihelion distance was just 1.3 solar radii. Astronomers at the time, including Edmond Halley, speculated that this comet was a return of a bright comet seen close to the Sun in the sky in 1106. 163 years later, the Great Comet of 1843 appeared and also passed extremely close to the Sun. Despite orbital calculations showing that it had a period of several centuries, some astronomers wondered if it was a return of the 1680 comet. A bright comet seen in 1880 was found to be travelling on an almost identical orbit to that of 1843, as was the subsequent Great Comet of 1882. Some astronomers suggested that perhaps they were all one comet, whose orbital period was somehow being drastically shortened at each perihelion passage, perhaps by retardation by some dense material surrounding the Sun. An alternative suggestion was that the comets were all fragments of an earlier sun-grazing comet. This idea was first proposed in 1880, and its plausibility was amply demonstrated when the Great Comet of 1882 broke up into several fragments after its perihelion passage. In 1888, Heinrich Kreutz published a paper showing that the comets of 1843 (C/1843 D1, the Great March Comet), 1880 (C/1880 C1, the Great Southern Comet), and 1882 (C/1882 R1, Great September Comet) were probably fragments of a giant comet that had broken up several orbits before. The comet of 1680 proved to be unrelated to this family of comets. After another Kreutz Sungrazer was seen in 1887 (C/1887 B1, the Great Southern Comet of 1887), the next one did not appear until 1945. Two further sungrazers appeared in the 1960s, Comet Pereyra in 1963 and Comet Ikeya–Seki, which became extremely bright in 1965, and broke into three pieces after its perihelion. The appearance of two Kreutz Sungrazers in quick succession inspired further study of the dynamics of the group. The brightest members of the Kreutz Sungrazers have been spectacular, easily visible in the daytime sky. The three most impressive have been the Great Comet of 1843, the Great Comet of 1882 and Comet Ikeya–Seki. Another notable Kreutz Sungrazer was the Eclipse Comet of 1882 (see further below). The comet was very prominent throughout early March, before fading away to almost below naked eye visibility by the beginning of April. It was last detected on April 20. This comet apparently made a substantial impression on the public, inspiring in some a fear that judgement day was imminent. A party of observers gathered in Egypt to watch a solar eclipse in May 1882 were greatly surprised when they observed a bright streak near to the Sun once totality began. By a remarkable coincidence, the eclipse had coincided with the perihelion passage of a Kreutz comet. The comet would otherwise have gone unnoticed — its sighting during the eclipse was the only observation of it. Photographs of the eclipse revealed that the comet had moved noticeably during the 1m50s eclipse, as would be expected for a comet racing past the Sun at almost 500 km/s. The comet is sometimes referred to as Tewfik, after Tewfik Pasha, the Khedive of Egypt at the time. The Great Comet of 1882 was discovered independently by many observers, as it was already easily visible to the naked eye when it appeared in early September 1882, just a few days before perihelion. It grew rapidly brighter and was eventually so bright it was visible in the daytime for two days (16–17 September), even through light cloud. After its perihelion passage, the comet remained bright for several weeks. During October, its nucleus was seen to fragment into first two and then four pieces. Some observers also reported seeing diffuse patches of light several degrees away from the nucleus. The rate of separation of the fragments of the nucleus was such that they will return about a century apart, between 670 and 960 years after the break-up. A study by Brian G. Marsden in 1967 was the first attempt to trace back the orbital history of the group to identify the progenitor comet. All known members of the group up until 1965 had almost identical orbital inclinations at about 144°, as well as very similar values for the longitude of perihelion at 280–282°, with a couple of outlying points probably due to uncertain orbital calculations. A greater range of values existed for the argument of perihelion and longitude of the ascending node. Marsden found that the Kreutz Sungrazers could be split into two groups, with slightly different orbital elements, implying that the family resulted from fragmentations at more than one perihelion. Tracing back the orbits of Ikeya–Seki and the Great Comet of 1882, Marsden found that at their previous perihelion passage, the difference between their orbital elements was of the same order of magnitude as the difference between the elements of the fragments of Ikeya–Seki after it broke up. This meant it was realistic to presume that they were two parts of the same comet which had broken up one orbit ago. By far the best candidate for the progenitor comet was that seen in 1106 (Great Comet of 1106): Ikeya–Seki's derived orbital period gave a previous perihelion almost exactly at the right time, and while the Great Comet of 1882's derived orbit implied a previous perihelion a few decades later, it would only require a small error in the orbital elements to bring it into agreement. The sungrazing comets of 1668, 1689, 1702 and 1945 seem to be closely related to those of 1882 and 1965, although their orbits are not well enough determined to establish whether they broke off from the parent comet in 1106, or the previous perihelion passage before that, some time in the 3–5th centuries AD. This subgroup of comets is known as Subgroup II. Comet White–Ortiz–Bolelli, which was seen in 1970, is more closely related to this group than Subgroup I, but appears to have broken off during the previous orbit to the other fragments. The sungrazing comets observed in 1843 (Great Comet of 1843) and 1963 (Comet Pereyra) seem to be closely related and belong to the subgroup I, although when their orbits are traced back to one previous perihelion, the differences between the orbital elements are still rather large, probably implying that they broke apart from each other one revolution before that. They may not be related to the comet of 1106, but rather a comet that returned about 50 years before that. Subgroup I also includes comets seen in 1695, 1880 (Great Southern Comet of 1880) and in 1887 (Great Southern Comet of 1887), as well as the vast majority of comets detected by SOHO mission (see below). The distinction between the two sub-groups is thought to imply that they result from two separate parent comets, which themselves were once part of a 'grandparent' comet which fragmented several orbits previously. One possible candidate for the grandparent is a comet observed by Aristotle and Ephorus in 371 BC. Ephorus claimed to have seen this comet break into two. However modern astronomers are skeptical of the claims of Ephorus, because they were not confirmed by other sources. 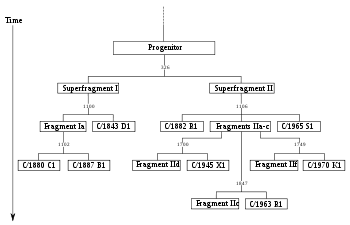 Instead comets that arrived between 3rd and 5th centuries AD (comets of 214, 426 and 467) are considered as possible progenerators of the Kreutz family. The original comet must certainly have been very large indeed, perhaps as large as 100 km across (for comparison, the nucleus of Comet Hale–Bopp was about 40 km across). Although its orbit is rather different from those of the main two groups, it is possible that the comet of 1680 is also related to the Kreutz Sungrazers via a fragmentation many orbits ago. The Kreutz Sungrazers are probably not a unique phenomenon. Studies have shown that for comets with high orbital inclinations and perihelion distances of less than about 2 AU, the cumulative effect of gravitational perturbations tends to result in sungrazing orbits. One study has estimated that Comet Hale–Bopp has about a 15% chance of eventually becoming a sun-grazing comet. Until recently, it would have been possible for even a very bright member of the Kreutz Sungrazers to pass through the inner solar system unnoticed, if its perihelion had occurred between about May and August. At this time of year, as seen from Earth, the comet would approach and recede almost directly behind the sun, and could only become visible extremely close to the sun if it became very bright. Only a remarkable coincidence between the perihelion passage of the Eclipse Comet of 1882 and a total solar eclipse allowed its discovery. However, during the 1980s, two Sun-observing satellites serendipitously discovered several new members of the Kreutz family, and since the launch of the SOHO Sun-observing satellite in 1995, it has been possible to observe comets very close to the sun at any time of year. The satellite provides a constant view of the immediate solar vicinity, and SOHO has now discovered hundreds of new sungrazing comets, some just a few metres across. About 83% of the sungrazers found by SOHO are members of the Kreutz group, with the other being referred to as 'non-Kreutz' or 'sporadic' sungrazers (Meyer, Marsden, and Kracht1&2 families). Apart from Comet Lovejoy, none of the sungrazers seen by SOHO has survived its perihelion passage; some may have plunged into the Sun itself, but most are likely to have simply evaporated away completely. More than 75% of the SOHO sungrazers have been discovered by amateur astronomers analysing SOHO's observations via the Internet. Some amateurs have managed remarkable numbers of discoveries, with Rainer Kracht of Germany having chalked up 211, Michael Oates of the United Kingdom making 144, and Zhou Bo of China spotting 97. As of December 2011, over 2,000 Kreutz Sungrazers have been identified using SOHO data. 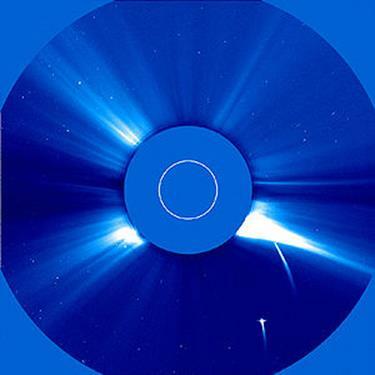 SOHO observations have shown that Sungrazers frequently arrive in pairs separated by a few hours. These pairs are too frequent to occur by chance, and cannot be due to break-ups on the previous orbit, because the fragments would have separated by a much greater distance. Instead, it is thought that the pairs result from fragmentations far away from the perihelion. Many comets have been observed to fragment far from perihelion, and it seems that in the case of the Kreutz Sungrazers, an initial fragmentation near perihelion can be followed by an ongoing 'cascade' of break-ups throughout the rest of the orbit. The number of Subgroup I Kreutz comets discovered is about four times the number of Subgroup II members. This suggests that the 'grandparent' comet split into parent comets of unequal size. Dynamically, the Kreutz Sungrazers might continue to be recognised as a distinct family for many thousands of years yet. Eventually their orbits will be dispersed by gravitational perturbations, although depending on the rate of fragmentation of the constituent parts, the group might be completely destroyed before it is gravitationally dispersed. The continuing discovery of large numbers of the smaller members of the family by SOHO will undoubtedly lead to a greater understanding of how comets break up to form families. It is not possible to estimate the chances of another very bright Kreutz comet arriving in the near future, but given that at least 10 have reached naked eye visibility over the last 200 years, another great comet from the Kreutz family seems almost certain to arrive at some point. Comet White–Ortiz–Bolelli in 1970 reached an apparent magnitude of 1. In December 2011, Kreutz sungrazer C/2011 W3 (Lovejoy) survived its perihelion passage and had an apparent magnitude of −3. 607 (1): 620–639. Bibcode:2004ApJ...607..620S. doi:10.1086/383466. hdl:2014/39288. 663 (1): 657–676. Bibcode:2007ApJ...663..657S. doi:10.1086/517490. hdl:2014/40925. 72 (9): 1170–1183. Bibcode:1967AJ.....72.1170M. doi:10.1086/110396. Sekanina, Zdeněk (2001). "Kreutz sungrazers: the ultimate case of cometary fragmentation and disintegration?" (PS). Publications of the Astronomical Institute of the Academy of Sciences of the Czech Republic (89): 78–93. 1 (2): 10–13. Bibcode:1849AJ......1...10H. doi:10.1086/100004. 6 (2): 3–6. 1843. Bibcode:1843MNRAS...6....3. 404 (6778): 574–576. Bibcode:2000Natur.404..574J. doi:10.1038/35007011. PMID 10766233. 43 (2): 203–209. 1883. Bibcode:1883MNRAS..43R.203. 98 (6): 2306–2321. Bibcode:1989AJ.....98.2306M. doi:10.1086/115301. 581 (2): 1389–1398. Bibcode:2002ApJ...581.1389S. doi:10.1086/344261. "Full list of SOHO and STEREO comets". British Astronomical Association and Society for Popular Astronomy. October 2008. Retrieved 2008-11-07. "SOHO Comet Discoverers' Totals". EarthLink. Retrieved 2008-07-02. Young, C. Alex (2011). "Lovejoy's Last Day - Unprecedented Multi-spacecraft Observations of a Comet's Demise (Surprise filled update 12/16/2011)". The Sun Today: Solar Facts & Space Weather (in English). C. Alex Young - The Sun Today. Retrieved 24 November 2013. 24 (3): 227–234. Bibcode:2007JASS...24..227L. doi:10.5140/JASS.2007.24.3.227. photosphere at perihelion. The comet was bright enough to be visible next to the sun in the daytime sky at its perihelion. The comet appeared suddenly in the morning skies of September 1882, and as it was already visible to the naked eye when it became visible it was discovered independently by many people. Reports suggest that it was first seen as early as 1 September 1882, from the Cape of Good Hope as well as the Gulf of Guinea, and over the next few days many observers in the southern hemisphere reported the new comet. The first astronomer to record observations of the comet was W. H. Finlay, the Chief Assistant at the Royal Observatory in Cape Town, South Africa. Finlay's observation on 7 September at 16h GMT was also an independent discovery, and he reported that the comet had an apparent magnitude of about 3, and a tail about a degree in length. The comet brightened rapidly, and within days had become an exceptionally bright object. Her Majesty's Astronomer at the Cape, David Gill, reported watching the comet rise a few minutes before the Sun on 18 September, and described it as "The nucleus was then undoubtedly single, and certainly rather under than over 4″ in diameter; in fact, as I have described it, it resembled very much a star of the 1st magnitude seen by daylight. ". The comet was rapidly approaching perihelion when it was discovered. At perihelion, the comet is estimated to have been only 480,000 kilometres (0.0032 AU) from the sun's surface. Subsequent orbital studies have determined that it was a Sungrazing comet, one which passes extremely close to the surface of the Sun. For many hours on either side of its perihelion passage, the comet was easily visible in the daytime sky next to the Sun. It reached an estimated magnitude of −17. Shortly after perihelion was reached on 17 September, the comet transited the Sun. At the Cape, Finlay observed the comet with the aid of a neutral density filter right up until the moment of transit, when the Sun's limb was "boiling all about it". Finlay noted that the comet disappeared from view very suddenly, and no trace of it could be seen against the Sun's surface. After its perihelion passage, the comet moved into dark skies, and although it faded as it receded from the Sun it remained one of the most prominent objects in the sky. On 30 September, observers, including Finlay and E. E. Barnard, began to notice that the comet's nucleus was elongated and broken into two pronounced bright balls of light, and by 17 October it was clear that it had broken into at least five fragments. Observers reported that the relative brightness of the fragments varied from day to day. 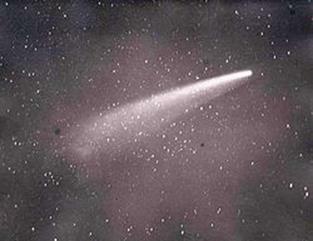 In mid-October, the comet developed a notable antitail, pointing towards the Sun. Anti-tails are a fairly common cometary phenomenon, and result from orbital geometry giving the appearance of a tail pointing towards the Sun although material can only be driven away from the Sun. The nucleus reached its maximum apparent size in December 1882. The comet faded gradually, but despite its fragmentation it remained visible to the naked eye until February 1883. The last definite sighting of the comet was made by B. A. Gould at Córdoba on 1 June 1883. Studies of the orbit of the comet showed that the Great Comet of 1882 was moving on an almost identical path to previous great comets seen in C/1843 D1 and C/1880 C1. These comets had also suddenly appeared in the morning sky and had passed extremely close to the Sun at perihelion. One suggestion was that all three were in fact the same comet, with an orbital period that was being drastically shortened at each perihelion passage. However, studies showed this to be untenable, as the orbital period of this comet is 772 ± 3 years and the others are 600–800 years. Heinrich Kreutz studied the orbits of the three great comets, and developed the idea that the three comets were fragments of a much larger progenitor comet which had broken up at an earlier perihelion passage. The fragmentation of the Great Comet of 1882 itself demonstrated that this was plausible. It is now thought that the Great Comet of 1882 is a fragment of X/1106 C1, and that Comet du Toit (C/1945 X1) and Comet Ikeya–Seki (C/1965 S1) are two of its sister fragments. It is now well established that the comets C/1843 D1, C/1880 C1, C/1882 R1, C/1887 B1, C/1963 R1, C/1965 S1, and C/1970 K1 are all members of a family known as the Kreutz Sungrazers, which are all descended from one comet. Current models do not support the frequent supposition in the prior literature that the famous comet of 372 BC is in fact the ultimate parent of the Sungrazers. The comet of 372 BC is often associated with Aristotle who, along with others from his time, described that comet in his writings. However, Aristotle was only twelve at the time of the comet's appearance and the historian, Callisthenes of Olynthus, who also wrote about it was born ten years after its appearance. Consequently, their reports should not be taken as eye-witness accounts. Further, there is no mention of the comet in Chinese literature of the time. Instead either the comet of February 423 or of February 467 with orbital periods of around 700 years is now considered the likely progenitor of the Sungrazers. The fragments of the Great Comet of 1882 will return in several hundred years' time, spread out over perhaps two or three centuries. There are two comets named Ikeya–Seki: C/1965 S1 (this one), and C/1967 Y1, a.k.a. 1968 I, 1967n. comet discovered independently by Kaoru Ikeya and Tsutomu Seki. First observed as a faint telescopic object on September 18, 1965, the first calculations of its orbit suggested that on October 21, it would pass just 450,000 km above the Sun's surface, and would probably become extremely bright. Comets can defy such predictions, but Ikeya–Seki performed as expected. As it approached perihelion observers reported that it was clearly visible in the daytime sky next to the Sun. In Japan, where it reached perihelion at local noon, it was seen shining at magnitude −10. It proved to be one of the brightest comets seen in the last thousand years, and is sometimes known as the Great Comet of 1965. The comet was seen to break into three pieces just before its perihelion passage. The three pieces continued in almost identical orbits, and the comet re-appeared in the morning sky in late October, showing a very bright tail. By early 1966, it had faded from view as it receded into the outer solar system. Ikeya–Seki is a member of the Kreutz Sungrazers, which are suggested to be fragments of a large comet which broke up in 1106. Comet Ikeya–Seki, seen from Canberra, 31 October 1965. Drawing by David Nicholls.